One of the biggest political puzzles of 2014 is why the public remains so bearish about the economy, and in turn critical of Barack Obama’s stewardship of it, given clear signs that economic indicators are improving. As the new year began, the Associated Press summed up the optimistic outlook of experts succinctly: “Consumers will spend more. Government will cut less. Business will invest more. And more companies will hire.” In that regard, the Bureau of Labor Statistics first report of the year showed that the unemployment rate fell to a five-year low of 6.7 percent, and essentially remained at that level in February. But even so, much of the American public is still not over the Great Recession. And the factors that drive economic pessimism are not easily mitigated. Surveys show that a complex combination of partisanship and widening socio-economic gaps are in play, undermining chances of an improvement in the public mood any time soon. At the outset of what appeared to be a brightening economic climate, the Pew Research Center’s January national survey found just 16% of the public rating the national economy as excellent or good while a whopping 83% rated it as only fair or poor. This is little different than a year earlier when the survey found 12% giving the economy a positive rating and 86% rating it negatively. In fact, this is only modestly better than at any point since the onset of the Great Recession. The same pattern is seen in how Americans size up their personal finances. While Americans have a better opinion of their own finances than of the national economy, ratings of personal financial well-being remain well below what they were pre-recession. In 2007, and for much of the decade before it, about half of Americans rated their finances as excellent or good. Today, just 39% do. Pew Research Center’s on-going polls on the public’s reaction to news coverage of the economy in recent years underscore the depth of pessimism about the national economic outlook. The polling has consistently found Americans saying that the economic news they follow is at best mixed. In early February, the Pew Research Center noted that despite declining unemployment rates, and an improved stock market, the public’s perceptions of recent economic news had shown little change. While fewer these days say news reports are mostly bad, six-in-ten continue to say the news they hear about the economy is a mix of good and bad. And, the percentage saying it is mostly bad (33%) dwarfs the numbers saying it is mostly good (5%). In February, with the unemployment rate declining to 6.7% after being at 7% or higher through nearly all of 2013, most assessed news about jobs as mostly bad (42%) or mixed (44%). Politics is another factor in the public’s continued negative economic outlook. The Pew Research Center discovered nearly a decade ago that how Americans judged the economy had in part become a function of their partisanship. In the 1990s, Republicans, Democrats and Independents for the most part all saw the economy pretty much the same way – good, bad or mixed. But since then, Republicans and Democrats have seen different economic realities depending on who was president. Through George W. Bush’s two terms, Democrats were much less likely than others to say the economy was in excellent or good shape. Then, with Obama’s election, the reverse became true. 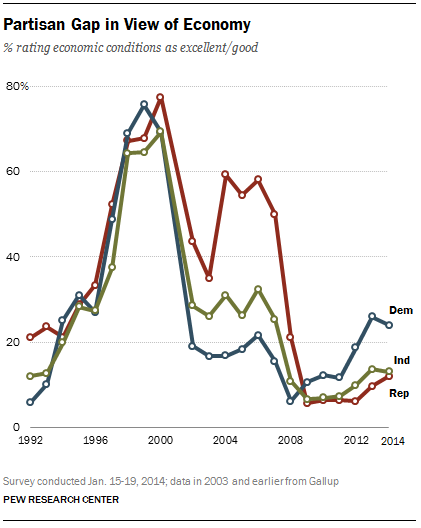 Republicans became less positive and more pessimistic than Democrats. While the partisan differences in bottom line opinion about the state of the national economy are modest compared with differences in the Bush years, they permeate economic attitudes, more generally. For example, in Pew Research’s February poll, fully 47% of Republicans but only 17% of Democrats said they were hearing mostly bad economic news. But, unlike views of the national economy, partisanship has less to do with judgments of one’s personal finances. Rather, socioeconomic factors are dominant. For example, college grads now size up their finances roughly as well as they did before the Great Recession took a toll on their outlook. In contrast, personal financial assessments of the less well-educated Americans have not improved as the economy has recovered after the Great Recession. And economic satisfaction has declined proportionately more since 2007 among those earning less than $100,000 per family than among those with family incomes of $100,000 or more. 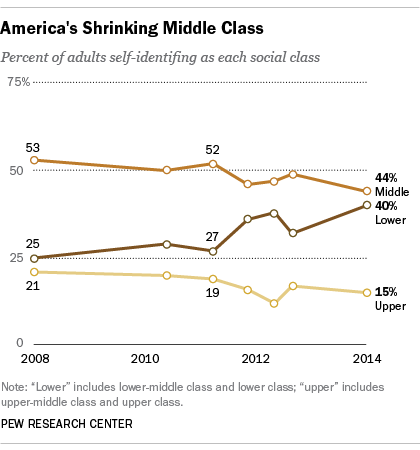 In a similar vein, the Pew Research Center recently reported that the share of Americans who identify with the middle class has fallen sharply in recent years, dropping to 44% in the latest survey from 53% in 2008 during the first months of the Great Recession. In part, the post-recession widening of socioeconomic gaps might be explained by the fact that while the unemployment rate has dipped, the number of Americans out of the work force remains high. But even here, economists speculate that, to some extent, the high rate of Americans that are out of the workforce may be in part a measure of increasing numbers of Baby Boomer retirements. The data suggest that economic attitudes may be more complex indicators than they once were. The public’s view of the national economy is now filtered through the lens of partisanship, and moderated by a continuing perception that the economic news is mixed at best, even as some economic indicators have improved. At the personal level, one’s economic outlook is shaped more by socioeconomic class today than in recent years. Read trends in economic attitudes with care, because they are no longer simply a measure of how well most Americans judge the nation’s condition or their own. They now also reflect increased polarization and growing financial divides in the U.S. It may be some time before the public sees the national economy in a positive light. And the personal financial outlook of middle- and lower-income people may well remain gridlocked into the future.